Ezra Taft Benson was born 4 August 1899 in Whitney, Idaho, United States to George Taft Benson (1875-1934) and Sarah Sophia Dunkley (1878-1933) and died 30 May 1994 in Salt Lake City, Utah, United States of unspecified causes. He married Flora Smith Amussen (1901-1992) 10 September 1926 . Ancestors are from the United States, the United Kingdom. Ezra Taft Benson (August 4, 1899 – May 30, 1994) was the thirteenth president of The Church of Jesus Christ of Latter-day Saints (LDS Church) from 1985 until his death and was United States Secretary of Agriculture for both terms of the presidency of Dwight D. Eisenhower. Born on a farm in Whitney, Idaho, Benson was the oldest of eleven children. He was the great-grandson of Ezra T. Benson, who was appointed by Brigham Young as a member of the Quorum of Twelve Apostles in 1846. Benson began his academic career at Utah State Agricultural College (now Utah State University), where he first met Flora Smith Amussen. Benson's alternated quarters at USAC with work on the family farm. Benson served a church mission in Britain from 1921 to 1923. It was while serving as a missionary, especially an experience in Sheffield that caused Benson to realize how central the Book of Mormon was to the Restored Gospel message and converting people to the LDS Church. He later served as president of the Newcastle Conference. After his mission Benson studied at Brigham Young University and finished his bachelors degree there in 1926. That same year he married Flora Smith Amussen, shortly after her return from her mission in Hawaii. He received his masters degree from Iowa State University. Several years later did preliminary work on a doctorate at the University of California at Berkeley, but never completed this degree. Just after receiving his masters he returned to Whitney to run the family farm. He later became the county agriculture extension agent for Oneida County, Idaho. He later was promoted to the supervisor of all county agents and moved to Boise. Ezra Taft and Flora Benson were the parents of six children. In 1930, Benson moved to Boise, Idaho where he worked in the central stake extension office connected with the University of Idaho Extension Service. He also founded a farmers cooperative. He was superintendent of the Boise Stake Young Men's Mutual Improvement Association and later a counselor in the stake presidency. By 1939 he had been made president of the Boise Stake. In 1939 he moved to Washington, D.C. to become Executive Secretary of the National Council of Farmer Cooperatives, and became the first president of a new LDS Church stake there. In August 1989, he received the Presidential Citizens Medal from President George H. W. Bush. On October 7, 1943, both Benson and Spencer W. Kimball (1895–1985) became members of the church's Quorum of the Twelve Apostles, filling two vacancies created by the deaths of apostles that summer. Because Kimball, being older, was ordained first, he was given seniority over Benson in the Quorum. Succession to the presidency of the church is by chronological order of ordination to apostleship, allowing Spencer W. Kimball to become president of the church years earlier than Benson. Upon Spencer W. Kimball's death in 1985, Benson became the president of the church. In 1953, Benson was appointed U.S. Secretary of Agriculture by President Eisenhower. Benson accepted this position with the permission of Church President David O. McKay and therefore served simultaneously in the United States Cabinet and in the LDS Church's Quorum of the Twelve Apostles. Benson opposed the system of government price supports and aid to farmers which he was entrusted by Eisenhower to administer, arguing that it amounted to unacceptable socialism. Nonetheless, he survived in his cabinet position for all eight years of Eisenhower's presidency. He was selected as the administrator-designate of the Emergency Food Agency, part of a secret group that became known as the Eisenhower Ten. The group was created by Eisenhower in 1958 to serve in the event of a national emergency. Benson was an outspoken opponent of communism and socialism, and supporter, but not a member, of the John Birch Society, which he praised as "the most effective non-church organization in our fight against creeping socialism and Godless Communism." He published a 1966 pamphlet entitled Civil Rights, Tool of Communist Deception. In a similar vein, during a 1972 general conference of the LDS Church, Benson recommended that all Mormons read Gary Allen's New World Order tract "None Dare Call it A Conspiracy". 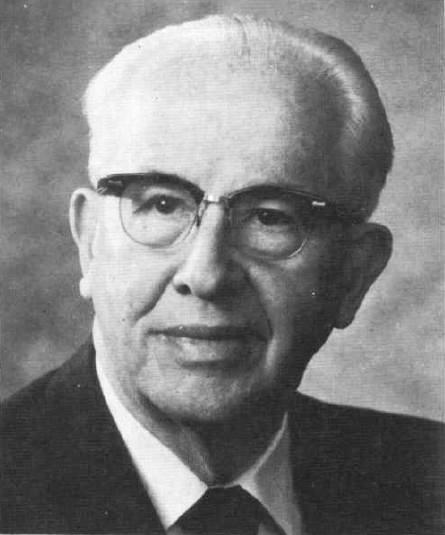 Benson succeeded Kimball as President of the Quorum of the Twelve Apostles in 1973, and as President of the Church in 1985. During his early years as Church President, Benson brought a renewed emphasis to the distribution and reading of the Book of Mormon, reaffirming this LDS scripture's importance as "the keystone of [the LDS] religion." He is also remembered for his general conference sermon condemning pride. Benson was a lifelong supporter of Scouting. He started in 1918 as assistant Scoutmaster. On May 23, 1949 he was elected a member of the National Executive Board of the Boy Scouts of America. He received the three highest national awards in the Boy Scouts of America—the Silver Beaver, the Silver Antelope, and the Silver Buffalo—as well as world Scouting’s international award, the Bronze Wolf. Benson suffered poor health in the last years of his life from the effects of blood clots in the brain, dementia, strokes, and heart attacks, and was rarely seen publicly in his final years. He was hospitalized in 1992 and 1993 with pneumonia. Benson died May 30, 1994 of congestive heart failure in his Salt Lake City apartment at the age of 94. Funeral services were held June 4, 1994 in the Salt Lake Tabernacle and conducted by Gordon B. Hinckley. He was buried near his birthplace in Whitney, Idaho, at the Whitney City Cemetery. Reed A. Benson., ed (1960). So Shall Ye Reap: Selected Addresses of Ezra Taft Benson. Deseret Book Company. ISBN B0007E7BME. The Red Carpet. Bookcraft. 1962. ISBN B0007F4WJI. Title of Liberty. compiled by Mark A. Benson. Deseret Book Company. 1964. An Enemy Hath Done This. Bookcraft. 1969. ISBN 0-88494-184-1. Civil Rights, Tool of Communist Deception. Deseret Book Co. 1969. ISBN (ASIN) B0007FRU42. God, Family, Country: Our Three Great Loyalties. Deseret Book Company. 1974. ISBN B0006CF3MC. Cross Fire: The Eight Years With Eisenhower. Doubleday. 1976. ISBN 0-8371-8422-3. This Nation Shall Endure. Deseret Book Company. 1977. ISBN 0-87747-658-6. Come Unto Christ. Deseret Book Company. 1983. ISBN 0-87747-997-6. The Constitution: A Heavenly Banner. Deseret Book Company. 1986. ISBN 0-87579-216-2. The Teachings of Ezra Taft Benson. Bookcraft. 1988. ISBN 0-88494-639-8. A Witness and a Warning: A Modern-Day Prophet Testifies of the Book of Mormon. Deseret Book Company. 1988. ISBN 0-87579-153-0. A Labor of Love: The 1946 European Mission of Ezra Taft Benson. Deseret Book Company. 1989. ISBN 0-87579-275-8. Come, Listen to a Prophet's Voice. Deseret Book Company. 1990. ISBN 0-87579-351-7. Missionaries to Match Our Message. Bookcraft. 1990. ISBN 0-88494-779-3. Elect Women of God. Bookcraft. 1992. ISBN 0-88494-838-2. Sermons and Writings of President Ezra Taft Benson. The Church of Jesus Christ of Latter-day Saints. 2003. Benson also wrote the foreword to The Black Hammer, a book by Wes Andrews and Clyde Dalton. In the foreword, Benson alleges that the civil-rights movement is a communist plot for revolution in America. ^ "Beware of Pride". The Church of Jesus Christ of Latter-day Saints. http://lds.org/ldsorg/v/index.jsp?hideNav=1&locale=0&sourceId=d8ff27cd3f37b010VgnVCM1000004d82620a____&vgnextoid=2354fccf2b7db010VgnVCM1000004d82620aRCRD. Retrieved 2008-05-05. ^ Church Educational System (2005). "Chapter 13: Ezra Taft Benson, Thirteenth President of the Church". Presidents of the Church: Student Manual. LDS Church. http://www.ldsces.org/inst_manuals/pres-sm/pres-ch-13-15.htm#13. Retrieved 2011-01-28. Ensign Editor (July 1994). President Ezra Taft Benson: A Sure Voice of Faith. Ensign. p. 8. http://library.lds.org/nxt/gateway.dll/Magazines/Ensign/1994.htm/ensign%20july%201994.htm/president%20ezra%20taft%20benson%20a%20sure%20voice%20of%20faith.htm?f=templates$fn=document-frame.htm$q=$x=. Monson, Thomas S. (July 1994). President Ezra Taft Benson—A Giant among Men. Ensign. p. 35. http://library.lds.org/nxt/gateway.dll/Magazines/Ensign/1994.htm/ensign%20july%201994.htm/president%20ezra%20taft%20benson%20a%20giant%20among%20men.htm?f=templates$fn=document-frame.htm$q=$x=. This page uses content from the English language Wikipedia. The original content was at Template:U.S. Cabinet Official box. The list of authors can be seen in the page history. As with this Familypedia wiki, the content of Wikipedia is available under the Creative Commons License. This page uses content from the English language Wikipedia. The original content was at Ezra Taft Benson. The list of authors can be seen in the page history. As with this Familypedia wiki, the content of Wikipedia is available under the Creative Commons License.